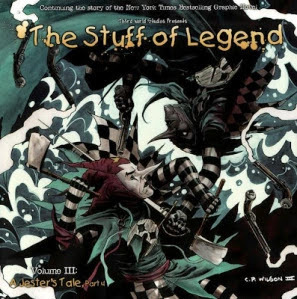 The Stuff of Legend was a favorite comic series of mine for years. I'm getting back into comics, and it still hasn't been collected as far as I can tell. I hope it ends soon. Originally published February 16, 2012. Edited for spelling and clarity. With the rise of graphic novels and the Bone books now in full color and continuing on as a series of prose novels, it seems like there's something at least close to a glut as more and more comic books geared for children are published in the hopes that the new Bone will happen. I've seen a lot of quality work, and a lot of work that seems more marketed than artistic. In the last year or so, it seems the clear winner isn't so much an all ages book as one for a more intermediate age. The Stuff of Legend, a title we've mentioned here often, is heavy reading. Three volumes in from Th3rd World Studios, and writers Mike Raicht and Brian Smith reveal no signs of an end to the difficult ride for the main characters or the book's readers. Beautifully illustrated by Charles Paul Wilson III, a boy's group of toys along with his dog setting out to rescue a boy from The clutches of the Boogeyman. Though not strictly swords and sorcery (it takes place in America during World War II), the book has enough of a magical feel and an epic approach to an idea of lost toys that has been seen in places like the Toy Story series, though less-lightheartedly (and remember, the Toy Story movies got much less light-hearted as they went on). For many of us, lost toys and loss of innocence have been with us since our first TV Christmas specials. That said, Stuff of Legend may not necessarily be for every young child. Not just for the bloodshed within but for its unrelenting mature themes. This is not textbook Happily Ever After territory, but it's written well enough that it works that way. The source of the drama and the main obstacle (aside form the Boogeyman and his minions) is that nearly every single one of the toys have their own agendas and conflicts towards saving the boy. Unlike Lord of The Rings, which begin with the forging of an alliance of heroes before it dissolves, one could argue that the only true hero is removed from the picture by the first chapter of The Dark, the series' first volume, and the remaining characters have to find their way without them. The Dark and The Jungle, have recently been collected. The third volume, A Jester's Tale, just recently finished its initial four issue pamphlet run. This story focuses on The back story of The Jester, a ruthless ax wielding rouge who could be seen by most comics readers as the one Wolverine type of character. He's very likely many a young reader's favorite (however many there might be). I was afraid the latest four issues would deviate and take the feel of a mini-series, making it feel more like mainstream comics fanfare than a mature story chapter. This thankfully wasn't the case. Just as truths about the Jester and even The Boogeyman are revealed, the main story never gets sidetracked even as the other characters and their quest continue to stay inert, as heroes and villains remain trapped in prisons of both their own making and The Boogeyman's. This might be tough for a younger reader to handle. A preview image of Book 4, The Toy Collector (not out till the summer) shows no relief in sight for the awkward heroes. A younger reader used to traditional contemporary Disney-like fantasy might throw the book down and think "Where will it end?" For the right reader though, a twisting ride with no end is a very good thing.